William Miller Frazer (1894-1961) a Scottish artist, born in Scone, Scotland. He lived in Edinburgh, and painted mainly the landscapes of the Northern British Isles. One of the best loved artists of his day, he tried to capture the atmosphere, nature, time of day and the season in his landscape paintings. 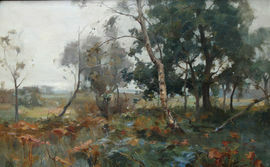 Frazer exhibited at the RSA throughout his life and also at the RA, RSW, GI and RBA.